Today's ink is J. Herbin 1670 Rouge Hematite. I've been wanting to try this one for a while since I liked Emerald of Chivor so much, so let's take a look. I purchased my samples of ink from Goulet Pens. Rouge Hematite is a bright red/pink with a greenish sheen and gold shimmer. In ink drops, I didn't even notice the gold shimmer, because the sheen overwhelms everything else. This is not a subtle ink by any means. It's one that punches you in the face. Dry time: 90 seconds-this is the longest dry time I have ever seen. It looks "dry" after 50, but is still smearable until a full 90 seconds have passed. Bleeding: Low-there was a little bit of bleeding in the flex nib. Other properties: No shading, high green sheen, and gold shimmer. On 20 pound copy paper the ink did pretty well, just a little bit of feathering. Ink swabs for comparison, left to right (top to bottom for mobile RSS): Pelikan Edelstein Ruby, J. Herbon 1670 Rouge Hematite, and Diamine Red Lustre. 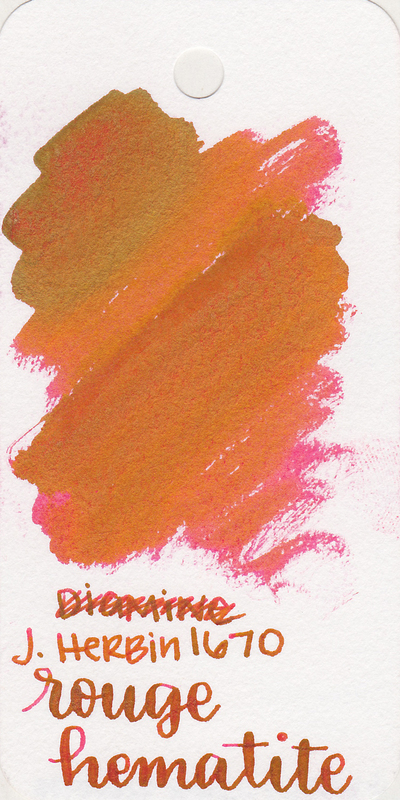 Click here to see the J. Herbin inks together. 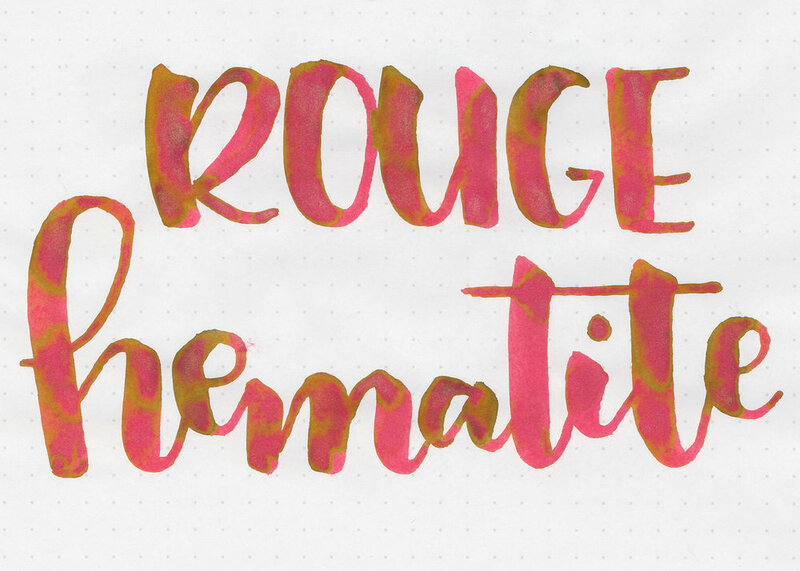 Rouge Hematite is not as bright as Red Lustre, but they both have gold shimmer. Robert Oster Crimson, Organics Studio Mercury Red, and Robert Oster Rubine. Click here to see the red inks together. I used a medium Edison Nouveau Premier Delphinium on Tomoe River paper. The ink is on the wet side. I did have some issues with nib creep, not an overwhelming amount, but I did have to wipe the nib off a few times. This ink is also very hard to clean out of your pens. I think had I left the ink in the pen for too long it would have stained the converter. The shimmer did not stay in suspension long for me. I had to rotate the pen about every three words to keep the shimmer flowing freely and evenly. Overall, there are a few issues with this ink-the sheen overwhelms the shimmer, it has a very long dry time, some nib creep, shimmer doesn't stay in suspension, and it's hard to clean out of pens. If you love the color, give it a try-you might find you love it. It's not one I will be running out to buy anytime soon. Disclaimer: I purchased this ink myself and all photos and opinions are my own. There are no affiliate links in this post.